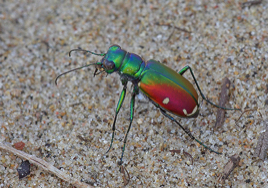 “Tiger beetles, with their colorful appearance, interesting habits, and amazing diversity, have long attracted the attention of amateur naturalists and professional biologists” (Knisley & Schultz, 1997). You can certainly add photographers -- including us! -- to the group of folks who have been captivated by these fascinating insects. 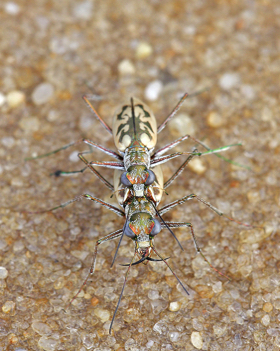 There are over 100 species of tiger beetles in the United States; of these, around 30 are known to occur in Alabama and/or Mississippi. Although the majority of species are rather dully colored, and often perfectly camouflaged to blend with their environment, others more than compensate with their brilliant colors of metallic green, red, or purple. These insects are active visual hunters, and their large eyes, long legs adapted for running, and huge sickle-shaped jaws are perfectly evolved for the task! They eat a variety of smaller organisms, mostly insects, and many species seem to prefer ants. Tiger beetles, despite their speed and ability to fly, are often prey items themselves; robber flies, lizards, or birds seem to be the usual culprits! Tiger beetle larvae are also carnivores, but they prefer to ambush their prey from the safety of burrows dug in the substrate. They have a peculiar set of humps & hooks on the top of the abdomen that help hold them in place in the burrow. 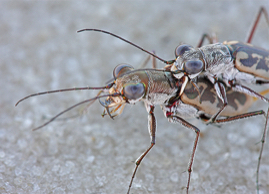 Adult tiger beetles can be found from early spring to late fall in our area, but the exact timing depends largely on the life history of a particular species. 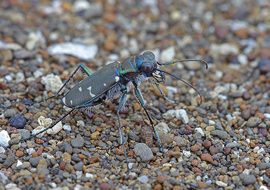 Some tiger beetles have a life history which results in most adults being present in spring and/or autumn, while others are present during the summer. Some species are strongly associated with water, while other species are never found near water. The understanding of the relationships among North American tiger beetles has improved significantly over the last decade or so, and some experts have adopted a classification scheme (with some accompanying changes in scientific names) that is somewhat different from the one we present below. When the "new" classification has been formally published in the peer-reviewed scientific literature, we will reflect those changes in our list, too. The following institutions generously allowed us to use the tiger beetle data in their collections to make these pages much more accurate and complete: Alabama Museum of Natural History (Milt Ward); Auburn University Entomological Collection (Charles Ray); Mississippi Entomological Museum (Terry Schiefer); University of Mississippi Collection (Paul Lago). In addition, we’d like to thank Giff Beaton, Brian Holt, and Mike Thomas for sharing their expertise and for being such good company in the field. Thanks, guys! !